When a host wants to make a reservation it will send a RSVP reservation request using a RSVP path message. This message is passed along the route towards the destination. When a router can guarantee the required bandwidth/delay it will forward the message. Once it reaches the destination it will reply with a RSVP resv message. The same process will occur for the opposite direction. Each router will check if they have enough bandwidth/delay for the flow and if so, they will forward the message towards the source of the reservation. Once the host receives the reservation message we are done. Now this might sound nice but the problem with IntServ is that it’s difficult to scale…each router has to keep track of each reservation for each flow. What if a certain router doesn’t support Intserv or loses it’s reservation information? Currently RSVP is mostly used for MPLS traffic engineering, we use DiffServ for QoS implementations. If you don’t specify the bandwidth then by default RSVP will use up to 75% of the interface bandwidth for reservations. I’m telling RSVP that it can only use up to 128 kbps for reservations and that the largest reservable flow can be 64 kbps. I will make a reservation between destination 192.168.34.4 and source 192.168.12.1 using TCP destination port 23 (telnet). The source port is 0 which means it can be anything. The average bitrate is 64 kbps with a maximum burst of 32 kbps. R4(config)#ip rsvp reservation-host 192.168.34.4 192.168.12.1 tcp 23 0 ff ? I can choose between controlled load or guaranteed bit rate. Guaranteed means the flow will have a bandwidth and delay guarantee. Controlled load will guarantee the bandwidth but not the delay. You can see that it has received the reservation from R1. What about R2 and R3? Above you can see how R2 reserved 64 kbps on its FastEthernet0/1 interface. You can see that R1 has received a path message from itself and that it forwards it towards 192.168.12.2. 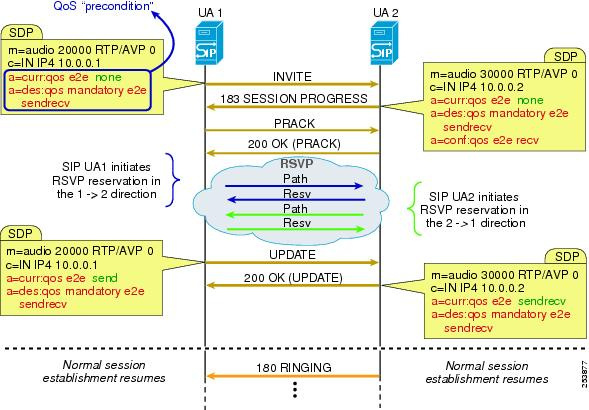 RSVP is used in Cisco Unified Communications architecture in a feature called Call Admission Control (CAC) makes a bandwidth reservation using RSVP along the full length of the path between the two communicating endpoints. Look at the following diagram that comes from Cisco documentation (the link to this document is shown further below).